YorkU’s KM Expo 2010 – there’s still time to register! Join us on Tuesday, March 2, 2010, when York University’s KM Unit will be hosting their third annual KM Expo at Le Parc in Richmond Hill. The theme of the YorkU KM Expo 2010 is “Bridging Cultural Boundaries: Push, Pull and Co-Production of Knowledge” and we will explore the unique cultural boundaries that exist between university researchers, graduate students and their non-academic research collaborators from community organizations and government agencies. 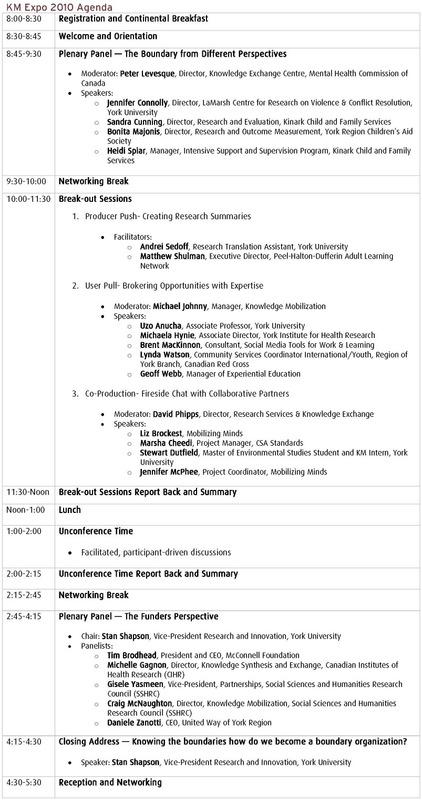 Featuring plenary, breakout, unconference and networking sessions, the KM Expo will explore how the push, pull and co-production methods of KM partnerships help universities and their partners become ‘boundary organizations’*. There is no cost to attend the Expo but space is limited. See below for the day’s agenda. Register early! RSVP to kejensen@yorku.ca or register online. * Boundary organization: an organization that sits at the boundary of and spans the cultures of research and action & of science and politics. From the South- Take the DVP/Highway 404 north and exit at Highway 7. Take Highway 7 west to Leslie Street. Turn left on Leslie and then right into the Le Parc parking lot. From the North- Take Highway 404 south and exit at Highway 7. Take Highway 7 west to Leslie Street. Turn left on Leslie and then right into the Le Parc parking lot. From York University- Take Highway 7 east to Leslie Street. Turn left on Leslie and then right into the Le Parc parking lot. Alternatively- take Highway 407 (toll road) to Leslie Street northbound and turn left into the Le Parc parking lot, just south of Highway 7. From Finch Station- Take the Viva Blue line to Richmond Hill Centre and transfer to the Viva Purple Eastbound line and depart at Leslie Street OR Take the Viva Pink from Finch Station and depart at Leslie Street (during peak hours only). Le Parc is located on the South-West corner of Leslie St and Highway 7. 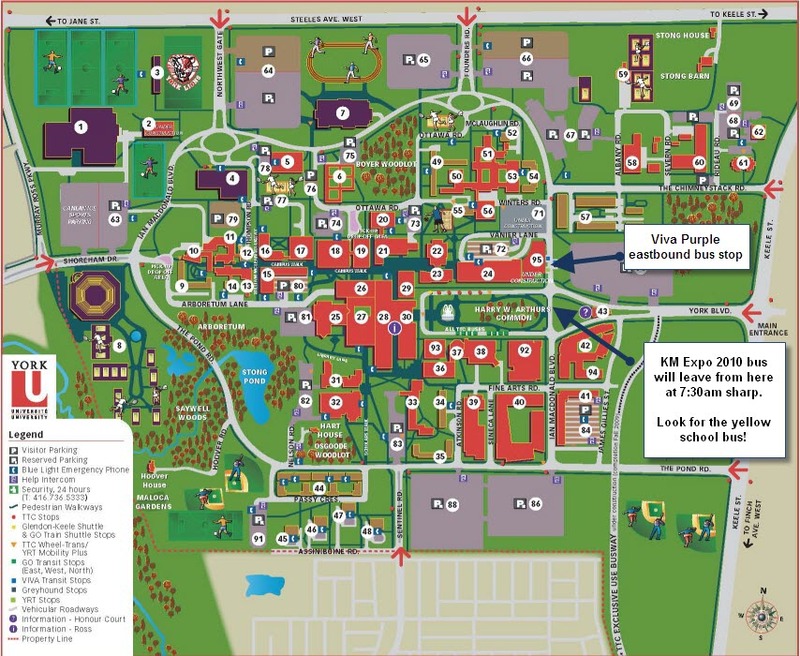 From York University Keele Campus- Take the Viva Purple Eastbound line and depart at Leslie Street. 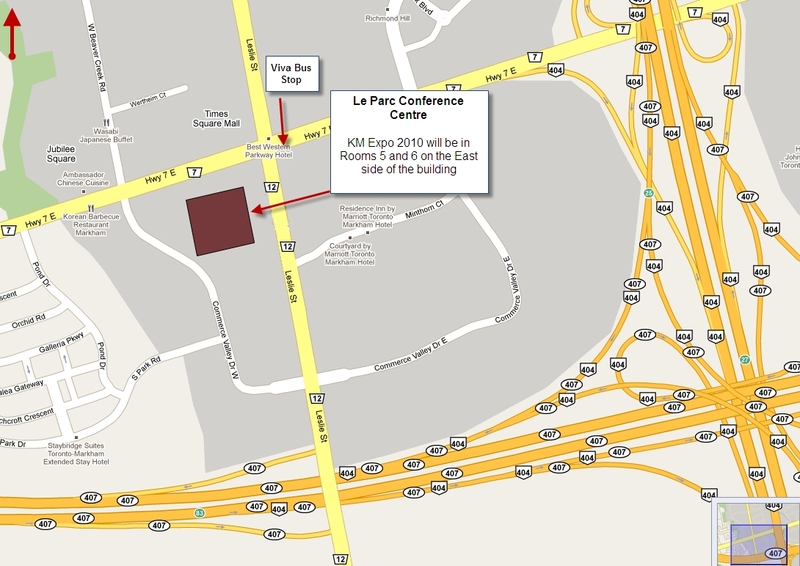 Le Parc is located on the South-West corner of Leslie St and Highway 7. Need a ride from York Keele Campus? There will be a bus leaving Keele Campus from the East side of the Commons by the flags, directly South of the York Research Tower, at 7:30am sharp and will return to campus from Le Parc at 5:00. If you miss the bus, you can take the Viva Purple Eastbound located in front of the Archives of Ontario building and depart at Leslie Street.